Your finest glass jug might impress guests but it won't look so elegant when it's in a thousand pieces. The Elite 4 Pint Polycarbonate Jug is made from highly durable, yet lightweight materials, ideal if you're dining outside, catering for younger guests or if there's alcohol involved. 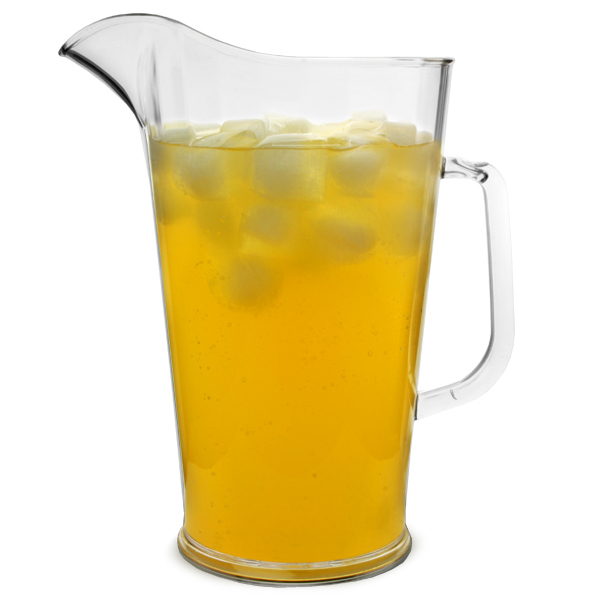 The simple ribbed design makes this versatile drinks pitcher great for water and juice at the table or beer and cocktails at the bar. LCE at 4 pints, this jug is also suitable for use in licensed establishments. "I had a jug which I got free once when I bought a bottle of Southern Comfort from the supermarket. The only problem was at 1.5 litres it wasn't big enough for storing anything worthwhile such as Pimms. 2.5l gives you much more room for Pimms and enables you to pour more than just a few drinks before having to make another mix!! Excellent size, great quality, and overall fantastic value for money." "Great quality, using for Pimms and they are much nicer than the actual Pimms Jugs. Great quality, look like glass and just ideal." Superb Deal And Service All Round. Highly Recommended. "Polycarbonate Glasses. High quality extremely clear glasses which are as they say "unbreakable". These are the only type of glasses to have in and around wet areas, pools or hot tubs. Superb products." "These plastic jugs are fantastic. The fact they can be used in the dishwasher and are unbreakable makes them a perfect party investment!"